April 13, 2015 – Toronto, Ontario – Corus Entertainment’s TELETOON has commissioned the animated comedy series, The Bagel and Becky Show from Radical Sheep Productions for their 2016/2017 slate. Production has started on 52×11 minute episodes of the animated series, based on the book “Bagel’s Lucky Hat” by Dave Cooper, co-creator of Nickelodeon’s PIGGOATBANANACRICKET. 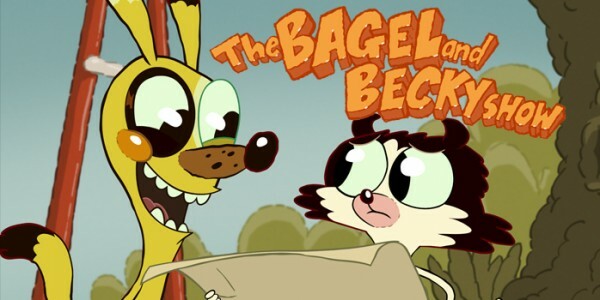 The Bagel and Becky Show is a bugged-out, offbeat comedy for kids 6-11, that follows a mismatched brother (Bagel the dog) and sister (Becky the cat) duo as they explore their neighbourhood of Awkward Hills and stumble into whackloads of outlandish situations. “We look forward to working with Radical Sheep Productions and bringing the whimsical tales of Bagel and Becky to life through this animated series,” says Athena Georgaklis, Director of Original Content at TELETOON. In a deal brokered by Serious Lunch, BBC Worldwide have acquired the World rights (excluding Canada) in all media to The Bagel and Becky Show. “This is a great partnership for BBC Worldwide, we have huge aspirations for The Bagel and Becky Show and can’t wait to help unleash it upon the world,” says Henrietta Hurford-Jones, Director of Children’s at BBC Worldwide. The Bagel and Becky Show is produced by Radical Sheep with John Leitch and Michelle Melanson Cuperus serving as Executive Producers and Doug Hadders and Adam Rotstein (Inspector Gadget, Sidekick) showrunning. TELETOON is a multi-platform brand that brings kids, youth and adults the best in animated and animation-related entertainment with five nationwide specialty television channels – TELETOON and TÉLÉTOON. TELETOON programming is accessible through On Demand, Mobile TV, iTunes and online properties. TELETOON is owned by Canadian-based media and entertainment company by Corus Entertainment Inc. For more information, please visit www.teletoon.com and www.corusent.com. BBC Worldwide is the main commercial arm and a wholly owned subsidiary of the British Broadcasting Corporation (BBC). Its vision is to build the BBC’s brands, audiences, commercial returns and reputation across the world. This is achieved through investing in, commercialising and showcasing content from the BBC around the world, in a way that is consistent with BBC standards and values. The business also champions British creativity globally. Serious Lunch was formed in 2011 by Genevieve Dexter following the sale of her previous company Cake Entertainment in 2010. The London based company specializes in the executive production of multimedia properties for children and families. This entry was posted on Tuesday, April 14th, 2015 at 9:12 am	and is filed under News. You can follow any responses to this entry through the RSS 2.0 feed.